In 1918 during the final months of World War I, while John Curtin campaigned for peace and an end to the war, Fred McLaughlin was serving with the Australian forces in the last battles they would see in France. 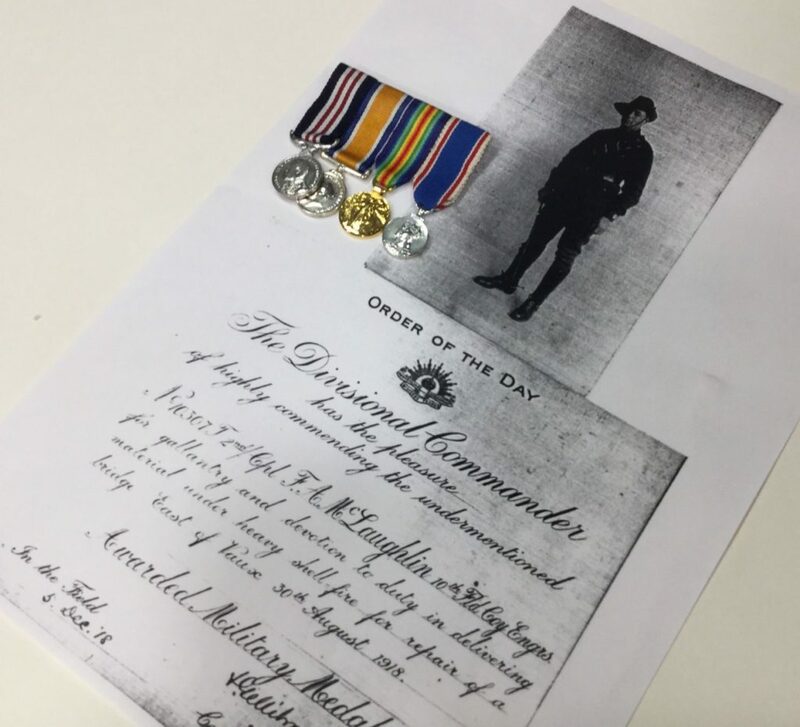 Object #46 is the dress set of Military and Service Medals (JCPML00372/1) awarded to Fred, who would become one of John Curtin’s most valued staff members and confidants during the next war. Fred McLaughlin was born in 1894 and on completing his Leaving Certificate was employed in the Defence Department. When war broke out, he and three of his brothers enlisted with the AIF 3rd Division. One of the brothers served in Egypt, while Fred and the other two were sent to France, where Fred served with the 10th Field Company Engineers. Fred was nominated for the Military Medal for gallantry and devotion to duty on 30 August 1918, which was awarded after the Armistice, in December 1918. Among the items most soldiers packed in their kit bags, Fred tucked a copy of Pitman’s Shorthand Instructor, which he apparently studied during his leisure hours in those years away from home. The four McLaughlin brothers all survived the conflict and following a lengthy demobilisation period were able to sail together on one of the last troop ships returning to Australia. After the war, Fred returned to a clerical position in Defence. In 1920 Fred’s diligence with his copy of Pitman’s was rewarded when he was appointed Private Secretary to the Minister for Defence, a role requiring proficiency in shorthand. Fred held the position for 26 years during which time he was able to utilise that skill, among others. 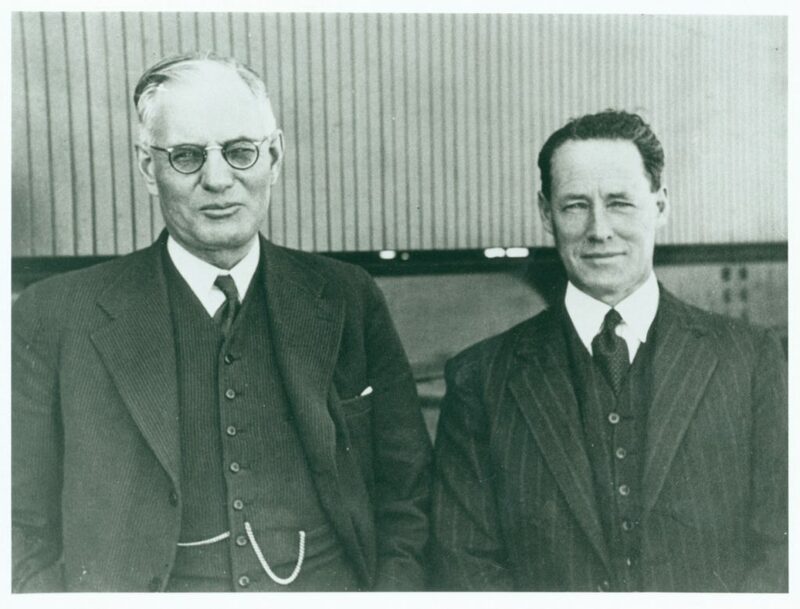 Described as the ‘Prince of Private Secretaries’, Fred served as Private Secretary to twelve Ministers for Defence, and as Departmental Private Secretary to several Prime Ministers including John Curtin. The set of Fred McLaughlin’s dress medals includes two other medals awarded to Fred for service in World War 1. 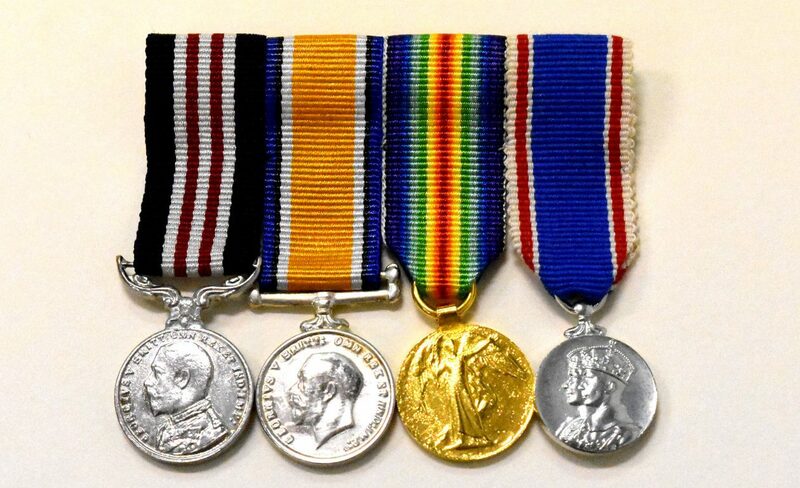 These are the General Service Medal awarded to all British Troops on active service in World War I, and the Victory Medal awarded to Allied troops at the conclusion of the war in 1918. The fourth medal was received much later when Fred was awarded the King’s Coronation Medal in 1937 for devoted public service. He was appointed Assistant Secretary, Defence Department, in 1946 and retired in 1954. JCPML00163/1 Interview with Frederick McLaughlin. JCPML00052/1 Buckley, J. 1985. A Soldier’s Tribute to John Curtin. JCPML00230/1 Medal award citation and Biographical note by Barbara Ross. Previous Previous post: 45. John Curtin’s Call up Notice – W.S Form 8 Order to Attend Military Training, 1916. Next Next post: 47. The Camp, by Vance Palmer, 1920 and letters from Katharine Susannah Prichard.